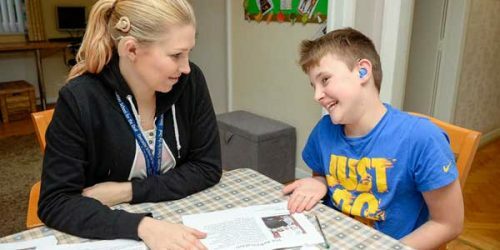 An experienced teacher is sought to lead and develop the specialist provision for students in the SENSS Hearing Resource Base at The Cherwell School in Oxford, commencing September 2019 or as soon as possible thereafter. The resource base supports students in Key Stages 3, 4 and 5 who have a hearing impairment. The wider SENSS service provides additional specialist support and the post holder will work closely with colleagues from health and other services. A sound understanding of best management practice and an ability to effectively lead and motivate a team, with a clear commitment to inclusive education is essential. You will have outstanding communication and organisational skills. You will be an excellent teacher, have good knowledge of how children and young people learn and how this can be facilitated in the classroom. You will have a broad, detailed and experience-based knowledge of special educational needs and disability and be resilient, reflective and solution focussed. Ideally you will be a Teacher of the Deaf holding the mandatory qualification or be training towards this, but we are also interested to hear from teachers with a strong commitment to inclusive education who are willing to undertake the mandatory training for teachers of the deaf. You will be joining a well-established team that is highly regarded by educational settings and other services and organisations in Oxfordshire and beyond. For an informal discussion about this and other roles, please contact Area Team Manager (HI) Tonia Harris on tonia.harris@oxfordshire.gov.uk or 07584 909522.